- or: "How To Make Yourself A Genius"
DELIBERATE PRACTICE - HOW DO YOU MAKE A GENIUS? The question of whether geniuses are ‘born‘ or ‘made’ was quite fully resolved years ago. showed that experts are always made, not born. "One of Ericsson's* core findings is that how expert one becomes at a skill has more to do with how one practices than with merely performing a skill a large number of times. "An expert breaks down the skills that are required to be expert and focuses on improving those "skill chunks" during practice or day-to-day activities, often paired with immediate coaching feedback. "Another important feature of deliberate practice: continually practicing a skill at more challenging levels with the intention of mastering it." “Made, not born” - What a relief! [So if some ‘authority’ says that ‘science has proven’ that genius is an ‘x factor’ and “some have it and some don’t”, you can refute that assertion by showing that science has proven the exact opposite! The ‘data mine’, as mentioned above, is: *“The Cambridge Handbook of Expertise and Expert Performance”, a 900-plus page book which includes contributions from more than 100 leading scientists. They have studied expertise and top performance in a wide variety of fields: surgery, acting, chess, writing, computer programming, ballet, music, aviation, firefighting, and many others. The Harvard Business Review article I’m referencing here is a summation of that 900 page 'encyclopedia'. We now know that the deciding factor of ‘GENIUS’, by far, is: ‘does the work get put in or not?’. So, given the willingness to do it, how do we get the best ‘bang for the buck’? - The greatest increase in skill per unit of practice time? “PRACTICE”: Perform (an activity) or exercise (a skill) repeatedly or regularly in order to improve or maintain one's proficiency. “For practice to be coined "deliberate" the activity must be "effortful", intense, and involve full concentration. "The task which is to be completed must take into account preexisting knowledge and abilities, thus offering an appropriate difficulty level for the aspiring student. ‘It really doesn’t matter how long. 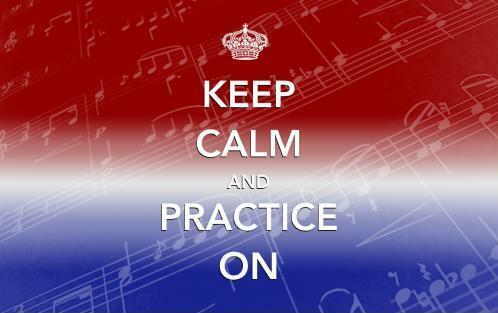 'If you practice with your fingers, no amount is enough. 1] CONCENTRATION - ON A SPECIFIC GOAL FOR THE PRACTICE SESSION, WHICH IS SOMETHING NOT ALREADY MASTERED. 2] AN EFFECTIVE COACH, OR ‘DRILL SERGEANT’. 3] DIGGING INTO MISTAKES AND CORRECTING THEM IMMEDIATELY - [also known as ‘FEEDBACK’]. 4] PRACTICING AT PEAK INTENSITY FOR SHORTER PERIODS OF TIME. 5] KNOWING WHEN TO SET YOUR OWN GOALS AND “PLAY” WITH THE SKILL YOU HAVE ACQUIRED. PART THREE - "IT'S NOT HOW MUCH, IT'S HOW"